The eerie warble of the Puerto Rican crested toad — a golden-eyed, pebbly-skinned species that’s Puerto Rico’s only native toad — is the most recent addition to our lineup of wildlife ringtones. Other popular picks are the siren song of the Okinawa dugong — a species fabled to have been mistaken for a mermaid by sailors — and the call of a relatively (and temporarily) pint-sized elephant seal pup as it cries for its mother. 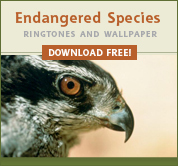 The Center for Biological Diversity offers you free endangered species ringtones and phone wallpapers — a collection of high-quality, authentic sounds of some of the world’s most threatened birds, owls, frogs, toads and marine mammals. Whether the cry of the Mexican gray wolf or the underwater warbles of the beluga whale, our ringtones provide a great starting point for talking about the plight of threatened species worldwide. In fact, they've been downloaded by about 620,000 people in nearly 180 countries around the globe, including the United Kingdom, Canada, China, Japan, Iran, India, Poland, Germany, France, Brazil, Australia, and the United States. Make a statement with your cell phone and download free endangered species ringtones now. These MP3 ringtones work with Android, Blackberry and Windows phones. We'll have M4R ringtones for Apple devices available soon. Do you have an endangered (or rare) wildlife recording you'd like to share? We'd love to hear it. Send a sound file to center@biologicaldiversity.org or ask us for instructions on mailing a tape or CD. View our Spanish version of this website at www.llamadassalvajes.org.